Ok, I’m back in the old USA after a grueling 10 day trip to Finland. The scenery was lovely, the Finns were charming and the company (my wife) was delightful. It was all very tiring though as we were attending an art festival in the rustic city of Kuopio and we walked miles every day. We did spend two days in Helsinki and I managed to sneak off and go see the military museum. I had just finished up my background book on the Russo-Finnish war Frozen Hell by William Trotter and was really wanting to see it. 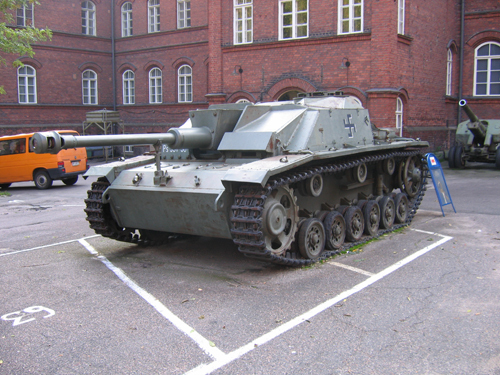 Here is a StuH 42 (I think that’s what it is) parked in front of the museum. Kiitos means Thank You and everybody says hello by saying “Hey” and goodbye can be “Hey Hey” I am a bit of a linguist myself having once been fairly proficient in German, Russian and Arabic. The Finnish language has got to be one of the hardest languages to master. The words are long……very long. And the vowels repeat with the frequency of losing symbols on a slot machine. Anyways, I am catching up on emails, fixing some odd bugs that trickled in over the last 10 days and working on finishing up the Mac version of Armageddon Empires. I wanted to have the Mac version out some time ago but a technical issue regarding the background music playing during the AI processing has been hounding me and no easy solution has presented itself. I have finally decided to disable the music for the Mac version when the AI processes its turns. Not very elegant but the stuttering that was going on during nested and recursive function calls was painful on the ears. I’m also working on a challenge game to be put up on the website. It will be a save game that has been edited on turn 1 to provide the AI’s with a heap of starting resources. More about that later. I’m also going to get back onto the AAR “Distant Thunder.” I have come to a critical decision point early in the game and like I tend to do in real life I have procrastinated on which path to choose. Aggressive attack risking it all on the roll of a die or a risky expedition to the East in search of resources. Both options are poor choices but hunkering down and turtling is going to be a recipe for disaster with the Xenopods and Mutants already well aware of where I am. And the Squidies are pretty close as well. I’m also going to continue the last entry as well and proceed with a little examination of the runaway leader phenomenon in strategy games. This entry was posted on Wednesday, October 3rd, 2007 at 8:25 am	and is filed under Game Design. You can follow any responses to this entry through the RSS 2.0 feed. Both comments and pings are currently closed.